Tell us about Productive Robotics. Productive Robotics Inc. designs, manufactures and markets collaborative industrial robots and accessories used in diverse manufacturing processes. We aim to set the new standard for simplifying robotic automation. Productive Robotics was spun out from ZBE, Inc. ZBE Inc.’s origin was in robotic camera systems used in motion pictures and television special effects. Through the years, ZBE Inc. developed a wide technology base spanning robotics, motion control, digital imaging and printing, hybrid micro-electronics and high precision mechatronic systems. Tell us about your collaborative robot OB7. OB7 was designed to deliver unmatched automation productivity, accuracy and safety – all without complicated software programming and coding. Learning without programming means anyone can teach OB7 to do hundreds of complex automation jobs quickly. The operator simply shows OB7 how to do the job by physically moving the cobot through the steps, and it learns and remembers. OB7 is compliant with ISO 10218-1 work safety guidelines and requirements. The cobot is equipped with safety sensors, so it can work safely at high speeds when people aren’t present and then slow to safer speeds when people are nearby. OB7 can be seamlessly integrated into any existing production and work cells. 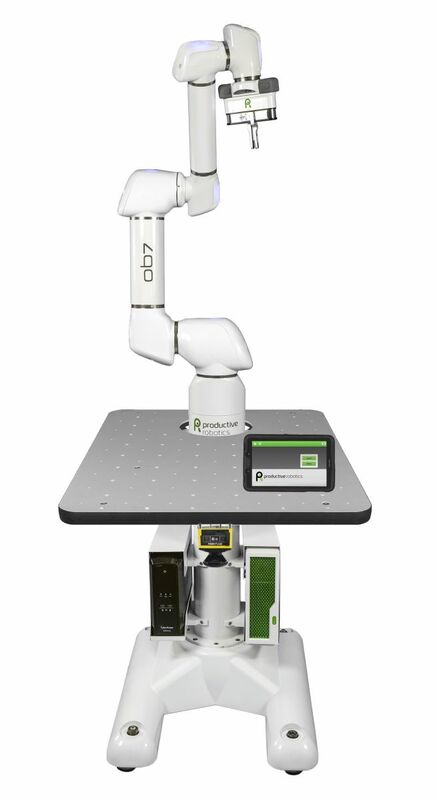 Its seven joints (like a human arm) provide freedom of movement so it is more maneuverable than most cobots and can reach around objects and obstacles in work areas that are not possible for cobots with fewer axes. It also can roll into existing production lines to start work quickly. OB7 has an 11 lb (5 kg) payload capacity, a 1-meter reach and .1 mm repeatable accuracy. How is OB7 different from other collaborative robots currently on the market? OB7 uses patent pending “teach without programming” technology, eliminating the need for operators to know how to code or program. Operators simply show OB7 the job by moving the robot, and it can learn both simple and complex jobs in minutes. It saves and recalls stored automation jobs for future use. OB7 also has seven joints, just like a human arm. This freedom of movement means it is more maneuverable than other collaborative robots on the market that only have six joints. OB7 can reach around objects and obstacles in work areas that are not possible for cobots with fewer axes. OB7 is less expensive than competing cobots because it employs several new technical innovations which decrease the cost to build it. Examples include: a revolutionary new gearing system that allows high precision combined with lower cost and longer life; a new measurement system; high speed networking within the robots; and other patent pending features, which help to lower the cost of producing OB7. Some existing collaborative robots were designed more than 10 years ago when these technologies did not exist. What does Productive Robotics mean by "embedded human senses" in its OB7 collaborative robots? Why is this beneficial? Each OB7 model can now be equipped with human-like senses which provide simpler, faster and more efficient robot training and operation. OB Vision is currently available; it allows OB7 to automatically learn to recognize and pick up objects with a single button push. By the end of this year, OB7 will also be equipped with an improved sense of touch. Both OB Vision and any additional senses are based on Productive Robotics’ innovative “no programming,” simple to teach platform. How is teaching OB7 different from “easy programming” and what steps do operators need to take to make it do what they want it to do? We believe “easy programming” is only “easy” for programmers. Therefore, OB7 requires NO user programming. Just show the cobot how to do the job by physically moving it through the necessary steps; it learns in minutes and remembers the automated jobs for future use. Common steps in a job, like opening a door or pushing a button, are built in to OB7. Specifics – such as number of parts to put in a box or how high to stack boxes – can be entered on OB7’s associated tablet. This ease increases user comfort, acceptance and confidence. Can OB7 do more than one production task, or do companies need to buy more than one cobot to accomplish all tasks that can be automated? OB7 can learn and remember multiple jobs and be used throughout the manufacturing facility, so companies are not required to buy multiple machines to accomplish different tasks unless desired. At tradeshows like ATX West and Automate you setup multiple cobots and even have “Demo Stations” where attendees can experience “teaching” OB7. Give us some details on that and what kind of feedback you get from people at the tradeshows? Our trade show visitors love playing with the robots. For people who've never used (or programmed) a robot before, they get wide-eyed when the robot does exactly what they've taught it. For people who have "programmed" robots, they usually don't believe or understand what "teaching without programming" means, at first. Then when they teach OB7, they're really surprised how much easier it is. Where do you see the use of cobots going in the next 5 years? Cobots will move into successively smaller and smaller businesses. Many businesses today don't have an understanding of what a cobot like OB7 can do for them, and how simple it is. What they've seen are robots in cages in much larger plants than their own. That's their view of the robots. It's shocking to them when they see cobots. It will take some time for that understanding to sink in widely. What do see as the biggest road blocks for cobots growth and how is Productive Robotics helping to overcome these roadblocks? As simple as cobots are, customers don't understand how to deploy them effectively. There's a bit of a learning curve. We've seen many cobots sitting idle in the corner. The customers bought them with great expectations, only to find out they didn't know enough to integrate the robot successfully. We focus on the job the customer needs the robot to do, to make sure the cobot will go in and get the job done successfully. Usually, that requires little more than helping them figure out the fixturing or some customizing of the gripper. We have an entire applications team that makes sure the customer's application will be a success. Zac Bogart is president of Productive Robotics, a company that designs, develops and manufactures collaborative robots. After graduating from the University of California at Berkeley with a bachelor’s degree in Electrical Engineering and Computer Science, Zac cofounded USFX, a movie special effects company.